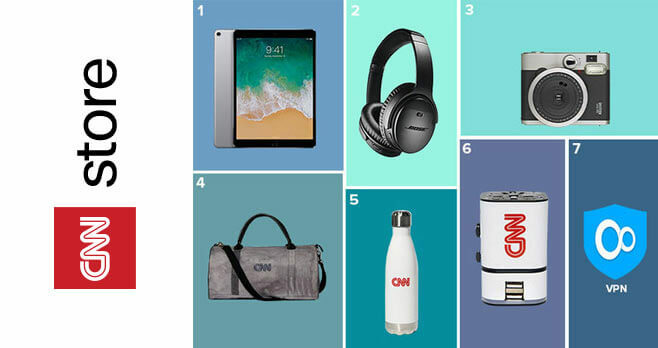 Visit https://store.cnn.com/giveaways/the-cnn-travelers-essentials-giveaway and enter the CNN Store Travelers Essentials Giveaway for your chance to win travel essentials including an iPad Pro, Bose headphones, CNN branded merchandise, a Fujifilm camera, and more. Ends: Ends at 11:59 pm PST on July 18, 2018. Prize: The winner will receive a prize package including an iPad Pro, Bose QuiteComfort 35 Noise Canceling Headphones, a CNN branded Outback Wax Duffel, a Fujifilm Instax Mini 90 Neo Classic Instant Film Camera, a Lifetime subscription to VPN service, a CNN branded Dual Port adapter, and a CNN branded insulated water bottle. Eligibility: The CNN Store Travelers Essentials Giveaway is open to legal residents of the 50 United States and District of Columbia, age 21 years or older.